A year ago I wrote about the record low number of active Tarrytown listings in MLS to kick off 2018. 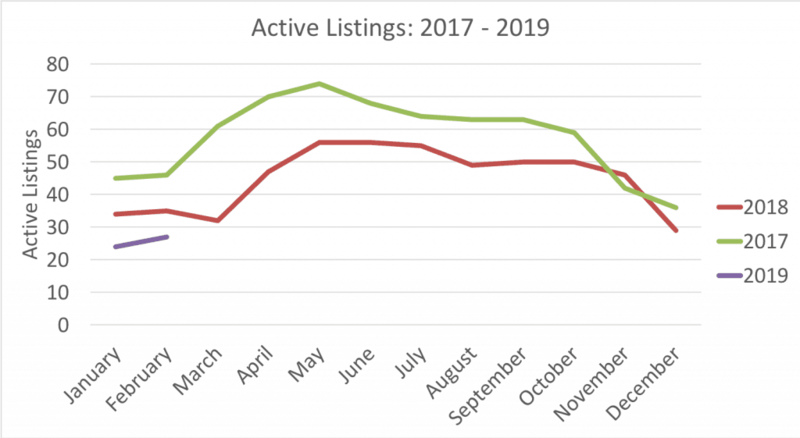 Last year in January there were 34 active listings, which was the lowest number of active listings in any month going back to 2004. Remarkably, in January of 2019 we set a new record low with only 22 active listings in MLS. In my newsletter article I showed a graph of past Januarys, but now that I have February data as well I am showing a graph of the last 3 years to look at the trend in active listings. The number of transactions is off to a strong start, though. In the first 2 months of 2019, there were 22! The previous post-recession record was 21 (in 2012). In the print edition I noted that through the first 6 weeks we were 40% ahead of the 2012 pace, so things have settled down a bit, though it is still a record year through the first 2 months. For a little more context, in 2005 there were 32 (the highest number of transactions going back to 1996 when records were digitized), and in 2009 there were just 9. If you want to make sense of what’s going on in the market, or would like a better understanding of what your own home is worth, please contact me and I’d be happy to help you. Note: All data comes from the Austin Board of Realtors’ MLS report, reflecting activity through February 28, 2019. New Austin Public Library – Central – Go See It!